Walking to her studio in downtown Kansas City, Calder Kamin saw an injured kestrel huddled under a bus shelter near Eighth Street and Grand Avenue. In daylight, the transparent Plexiglas of the shelter looks to birds like empty space, safe to fly through. This bird had hit the shelter hard, and despite Kamin’s rescue efforts (the artist took the injured animal to the Lakeside Nature Center for recovery), the kestrel succumbed to its injuries. The little kestrel spurred Kamin’s research into ways to prevent other birds from meeting the same fate. She learned that the outline of a bird on a pane of glass or other transparent surface can prevent collision—birds steer clear to avoid the decal’s airspace. 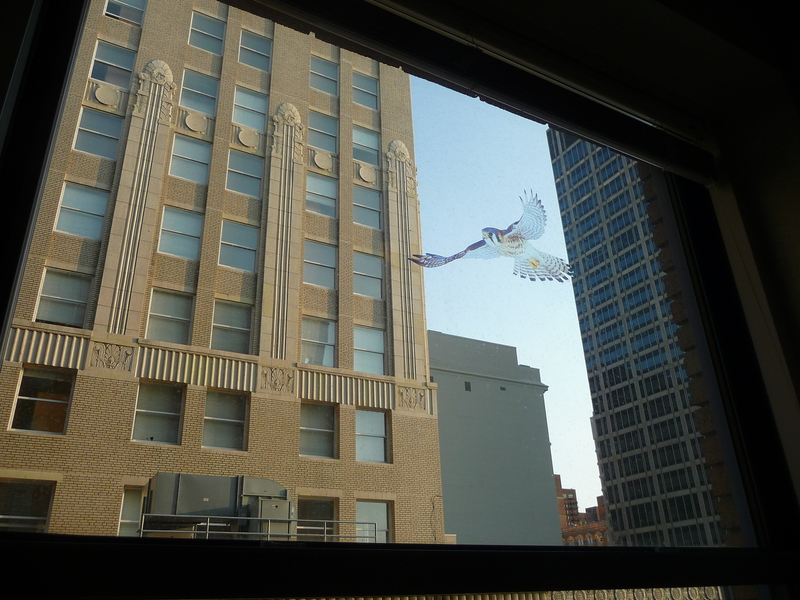 Impact proof, an installation of vinyl, kestrel-shaped decals on the windows of downtown structures (including the bus shelter where Kamin made her rescue attempt), comes out of this research. These decals appear in Window Unit, an installation space occupying five seventh-floor windows of an apartment building in downtown Kansas City. Window Unit’s intended audience includes workers and residents of adjacent buildings as well as passers-by on the street below. Kamin’s work engages people but has also been created for the neighborhood’s avian residents. The title Impact proof has a double meaning: the project impacts the coexistence of downtown Kansas City’s avian and human population by preventing birds from impacting the transparent surfaces humans use to shelter themselves. Synanthropes—animals that share a living space with humans, adapting to and often benefitting from the man-made environment—are of particular interest to the artist. And to find a synanthrope, one need look no farther than across the street from Window Unit. Pigeons roost on the ledges outside the deep-set windows of 909 Walnut, despite the metal bars installed to discourage them from building their nests. Kamin’s diverse, research-based practice aims not only to extend the lives of birds but also to educate the public on how our actions both help and harm the animals around us. A resident artist in the Charlotte Street Foundation’s Urban Culture Project, Kamin invited a representative of the Lakeside Nature Center to hold a presentation about local animals in her workspace during the spring 2012 open-studio weekend. The artist auctioned off a porcelain replica of the kestrel she hand-sculpted, with proceeds benefiting the Nature Center. She also disseminates her research through information-graphic-based animations and blogging. Kamin’s synanthrope-centered, post-studio practice demonstrates the meaning of the prefix “syn” in its truest sense—the daily interaction of Impact proof and the residents of downtown Kansas City produces a combined impact greater that the project’s reach might have been, had it appeared in a more traditional display space. Calder Kamin is an artist and art administrator in Kansas City, Missouri Before completing her BFA, for ceramics and art history from the Kansas City Art Institute in 2009, she curated for Red Star Studios, the Kansas City Art Institute’s Ferguson Teaching Collection and off campus galleries. She has shown nationally, and is in several notable collections in Kansas City. Kamin has returned to KCAI, as staff in Career Services, responsible for the development of the professional practice programing. She is a 2011-2012 resident artist in the Charlotte Street Foundation’s Urban Culture Project. Impact proof is on view from May 18 to August 19, 2012.